Hey! Longtime lurker first time poster here. Excited to share my newest purchase and project boat. She is a 1982 Scarab 377 KV. Purchased down in FL a few weeks ago and it will be making its way to Michigan next weekend to get setup for the restoration process. I have followed Back From the Dead for a while now, so that thread and information there will be a big help and I'm sure I'll come across my own problems and situations as I go. I'll keep this first post short and sweet but I'm excited to get started on her. I also started an Instagram page to document the process as well so if any of you are on there, check it out, its also "scarab377build". Can't post pictures yet so ask me some questions so I can get some photos on here for you guys!! hblair, larslindroth, payuppsucker and 2 others like this. 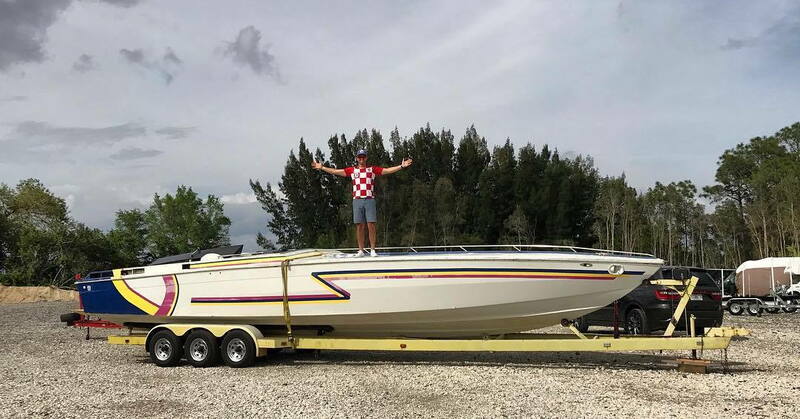 As most Croatians, You got an excellent taste in boats. Looking forward to seeing You bring this great Scarab back to life. Living on 'The Left Coast' myself, and at one point even lived in the epicenter of Croatian culture here; the famous LA Harbor old town of San Pedro, CA. Posting one of Your Instagram photos that I found very cool. Cheers, Lars. hblair, 93 shooter, payuppsucker and 2 others like this. Appreciate you posting that pic for me! I wish I could have had an opportunity to spend more time in Croatia when I was there, beautiful place. But I look forward to the process of getting this old girl back to running condition and spending many years enjoying it! The looks part you are definitely correct, that's why I went with this boat. Cannot beat the style and clean lines of these boats. I hope I can do the rest of the 377/38 flat deck guys proper justice with my build. I'm sure I will have a ton of questions and just idea making once i get going. Heath has set the bar pretty high for Scarab resto's, hope all goes well with your new baby too. Yes he has Jon...........following this as well. Where about in Michigan are you located?